With our second big announcement in as many weeks, JGB Enterprises is pleased to announce that the 100’ length of our Perfect Garden Hose will now be available in green. Over the past two seasons the 100’ length has only been available in our “trademark” blue color. However, due to the growing popularity of the green color, along with an abundance of customer requests, we’ve decided to include the green 100’ unit to our offering. We’re extremely excited about the expansion of our kink-free, extra flexible, & ultra-lightweight line of garden hoses. 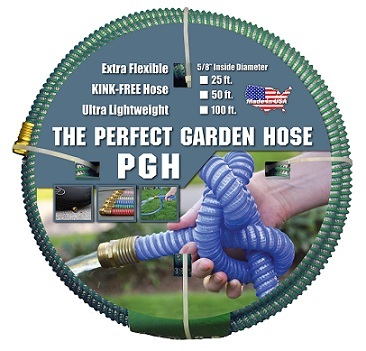 This marks the first expansion of The Perfect Garden Hose, and with the success we’ve seen over the past two seasons it’s a good bet we’ll expand the line further. Stay connected with us on You Tube, Facebook, Twitter, & Google+ for more news!! This entry was posted in Gardening Tips, Homeowner, In the News, Industrial, Landscaping, Pet Owners, Reviews & Testimonials, Uncategorized and tagged Business, Facebook, Garden hose, garden water hose, garden watering hose, gardening, Gardening News, Industrial Goods and Services, plumbing, Tap (valve), the perfect garden hose, TUFF GUARD The Perfect Garden Hose, Twitter, unkinkable garden hose, Valves Hoses and Fittings, water hose. Bookmark the permalink.